The slight Eskape GTX hiking boot provides excellent protection and comfort immediately noticeable. Here you are perfectly equipped for mountain biking and hiking. An abrasion resistant, quick-drying lining with excellent breathability ensures a comfortable fit. 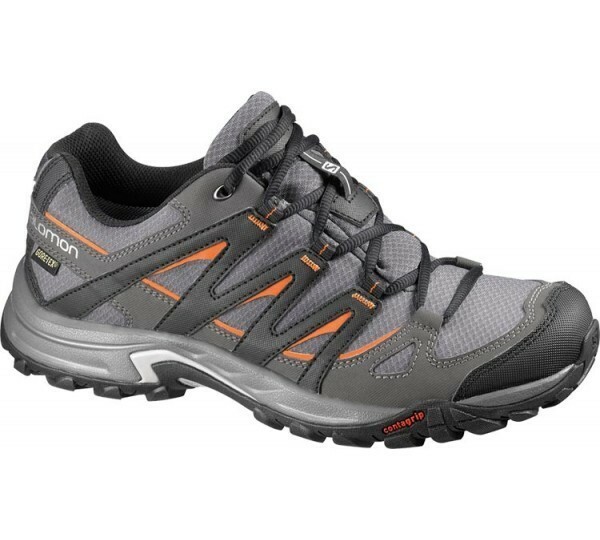 The Gore-Tex material ensures dry feet and provides an extra comfort. It is used specifically for strenuous activities where excellent water resistance and breathability are paramount. The Salomon Contagrip outsole provides a balanced and tailored to the individual needs of special combination of rubber and thus ensures optimum adhesion to different surfaces. The combination of different soles ensures an efficient, stable and responsive movement. Low cut: The low -cut profile provides for freedom of movement. Gusseted tongue: The tongue and the Obermateril are connected to each other so that no stone can penetrate. Heel protection: Ensures Stabiliät and protection in the heel. Mud protection: Protective material along the base of the shoe.